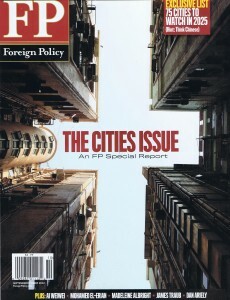 The September 2012 issue of Foreign Policy dedicated its cover story to cities, including a list of 75 cities to watch between now and 2025. Such a publication in a magazine dedicated to international politics is reveling. It shows that architecture plays a critical role not only in bringing quantitative solutions for the needs of a growing population, but also in determining the life quality standards of the 21st. Century. The Walker Building’s tenth anniversary since the completion of its adaptive reuse offered an opportunity to reevaluate life quality in the growing city from a personal experience. “Today, just 600 cities generate about 60 percent of the global GDP,” states one of the articles of the mentioned Foreign Policy issue. The question is: what kind of life quality these cities will offer to its citizens? Speed of construction matters, economically and demographically. Even at a very low rate of population growth, say 1% per year, the world will keep adding about 70,000 people a day. To make it tangible: two cities the size of Paris need to be built every year just to catch up. And what about reshaping the existing cities? Sustainability is much more that green buildings and the use of renewable sources of energy. The way we live in cities is critical: live-work vicinity, public transportation, access to urban facilities, to mention just a few, are all part of the sustainability equation. Urban quality must respond to the question of “how do we live?” There is no single answer that fits the needs of multiple cultures, geographies and economic conditions. Its answer will require envisioning and well-coordinated planetary management. 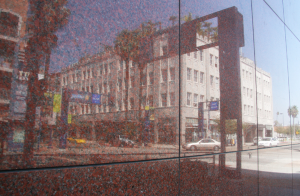 The Walker Building was originally designed by Meyer and Holler, the same architects that designed the Grauman Chinese and Egyptian theaters in Hollywood. It was conceived in a Renaissance Revival and Art Deco style, trendy at the time, and it was completed in 1929 to house the Hugh A. Marty Company. It consisted of four stories with a commercial base, built in reinforced concrete. Following the disastrous earthquake of 1933, Ralf H. Walker bought it and turned it into a department store. 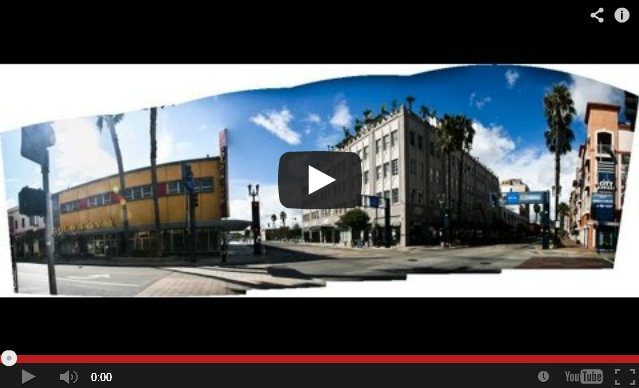 Long Beach’s downtown has gone through several ups and downs. Growing as a seaside resort at the beginning of the 20th Century, it boomed in the 1920s and 1930s, it decayed during the 1980’s and 1990’s and it restarted a Renaissance at the turn of the century. During the decay period, the Walker’s Store remained abandoned. Attracted by its location on Pine Avenue, downtown’s main street, a group of investors led by Bill Lindborg bought the building in 2000. 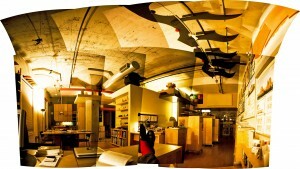 Lindborg hired architects Jon Glasgow and Gary Lamb of Interstices to design an adaptive reuse conversion into lofts. The contemporary design was sensitive to the building’s history. Some decorative features were restored. The building’s three floors were turned into live/work spaces and seven penthouses were added on the top. The roof garden included a conference room and a common outdoor area. My wife and I discovered it in May of 2002. We noted that the live/work lofts had been conceived as high-ceiling open spaces to allow maximum flexibility of personalized design to its dwellers. It was the right place to settle. daily life and to put above seven feet (about 2.10 m.) whatever was occasional or seasonal. We furnished it with off-the-shelve components. Some of these were put on wheels to facilitate change. Periodical social events and celebrations on the roof garden facilitated face-to-face interactivity, yet privacy was maintained at all times. Our dependence on the car was drastically reduced. We started to take long walks to the ocean. Gold’s Gym across the street became an extension of our daily life. We also became regular users of the central library, only three blocks away, and we walked to concerts at night. What messages does the Walker Building experience bring to some of the issues raised in the Foreign Policy’s cover story? Increase in density must be synonymous of life quality. The vicinity between living and working places are a sustainability issue. Adaptive reuse offers an opportunity to be creative while preserving the heritage. Walking distance to public transportation is a sustainability issue. Individual freedom of expression is possible within multi-unit buildings. The live/work approach may not fit everyone, but it may fit many: singles, young couples, seniors. The Walker Building’s experience, or its equivalent as new construction, reconfirms the importance of the relationship between quantity, quality and sustainability, and it emphasizes a critical factor in the search for economic solutions to the global urban crisis.